STRIKE ! More money for them, but Clients see little access to justice for legal aid hand-outs. LET’S not kid ourselves about the motives for recent strikes & protests by the Scottish legal profession against plans to cut Scotland’s ONE HUNDRED & SIXTY MILLION POUND legal aid budget, the highest legal aid budget in the entire European Union. This strike, and the protests outside the Scottish Parliament by cohorts of Scots lawyers carrying banners crying for “justice” is purely about more money for solicitors & law firms and has little to do with the profession’s call access to justice for Scots who may, rightly, or even wrongly, find themselves at the sharp end of the justice system for deeds they may or may not have committed. The strike certainly has nothing to do with Scots access to justice for civil legal aid, because in a week of listening to solicitors bleat like sheep about the rights of accused criminals to be funded on the legal aid purse, (and for those same solicitors to be entitled to collect more than £500 per hour), not one member of the legal profession has come forward to argue for increased attention to civil legal aid, particularly in cases where the legal profession’s own regulators have done the dirty on members of the public. The fuss, as great as it appears to be, is all about our Justice Secretary Kenny MacAskill’s idea to force solicitors to collect legal aid contributions from clients accused of criminal offences. Of course, with the headlines of legal aid fraud, and solicitors walking away with millions of pounds of legal aid money even after being accused by SLAB of making dodgy claims, it would be reasonable for anyone to ask “Is MacAskill’s plan for lawyers to collect our money safe ?” Well, put it this way, his plan is about as safe as allowing gangsters & loan sharks to collect for the Red Cross. Time for a new Justice Secretary, anyone ? 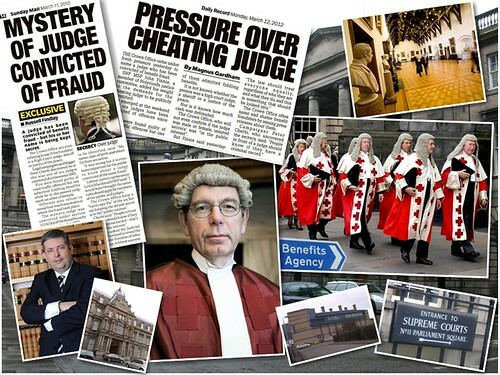 Surely after five years of disasters in the justice system, from World’s End to the continuing Lockerbie cover up to the review of the review of the review of Lord Gill’s condemnation of the Scottish Justice system in his 2009 Civil Courts Review and recent allegations of “Institutional Corruption” at Scotland’s Crown Office is well enough to require a new, firm pair of hands on the broken bottle that is our Scottish justice system ? 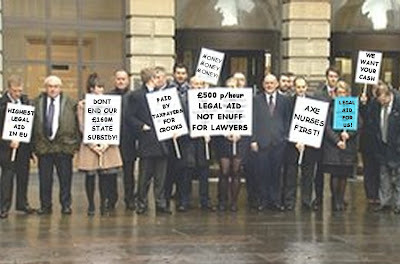 WHERE DOES ALL THE LEGAL AID GO ? EU report reveals Scots justice is more about lawyers & judges making money than delivering justice. 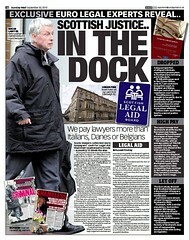 A REPORT published by the European Commission for the Efficiency of Justice and featured in an article in Scotland’s Sunday Mail newspaper has revealed Scottish lawyers take tens of millions of pounds more in publicly funded legal aid representing the Scots population of just over five million people than lawyers working Italy, which has a population of sixty million, twelve times greater than that of Scotland. 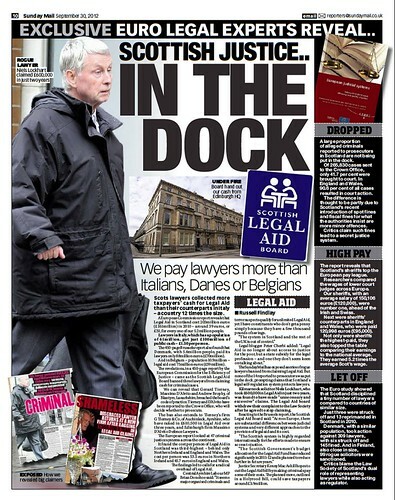 The figures show that Scots lawyers ‘earned’ around ONE HUNDRED & SIXTY MILLION POUNDS of legal aid in 2010 while their Italian counterparts working for a much larger client base only took £100million, making the Scots legal aid bill, running at a cost of £31 a head, the most expensive in Europe in terms of population. The grim figures show that Scots legal aid is working out at a cost of £31 a head, with little in the way of access to justice to show for it. The report, available on the EU website HERE (pdf) or online here : The European Commission for the Efficiency of Justice Report on Evaluation of European Judicial Systems also reveals Scots judges are paid the highest in Europe with Scottish Sheriffs taking home an average taxpayer funded salary of a staggering £120,000, while others on Scotland’s judicial benches take up to £200,000 a year plus expenses. In the bag ? ‘Sniffer dogs may have a better chance of catching John O’Donnell than Law Society’s Elaine Motion’. A ROGUE SOLICITOR remains at large in Scotland today after Law Society Chiefs claim they could not find him to serve a court order banning him from working as a solicitor. 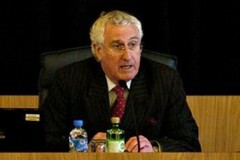 The lawyer in question, John G O’Donnell, who was suspended, then had his practising certificate removed after the media focussed on his trail of destruction which includes many ruined clients, is, according to the Law Society of Scotland “nowhere to be seen”, thus preventing the incompetent regulator from serving a court order obtain earlier in October at Scotland’s Court of Session. The recent case in Scotland’s Court of Session, where the Law Society sought an Interim Interdict preventing O’Donnell posing as a solicitor, only came about after further investigations by the Sunday Mail newspaper, who revealed that O’Donnell had been receiving clients desperately in need of legal assistance from ‘wannabe lawyers’ working for Hamilton Citizens Advice Bureau. QC Elaine Motion of Balfour & Manson, has represented the Law Society against John O’Donnell at hearings before the Scottish Solicitors Discipline Tribunal and now at the Court of Session, yet years have gone by, and the numbers of victims of O’Donnell increased markedly, without any substantive action on the part of regulators or Scotland’s Crown Office to go after O’Donnell to end his reign of terror over Scots who take him on, unknowingly. In an earlier attempt to get O’Donnell off the hook, and limit media coverage of the serial conman, legal representatives of O’Donnell tried to broker a deal at a Law Society Christmas party in 2009. Commenting on the latest development in the O’Donnell saga, a legal insider told Diary of Injustice this afternoon he felt the case was being handed very poorly by the Law Society, who could have gone after O’Donnell “years ago” to stop his trail of destroyed clients. If you know where rogue solicitor John G O’Donnell is, tell us via scottishlawreporters@gmail.com and the information will be passed on to the appropriate channels. A rogue lawyer is being hunted by watchdogs so they can tell him he's banned - again. John O'Donnell, 62, has been accused of breaching a ban on working as a solicitor following a Sunday Mail probe. The Law Society of Scotland's Elaine Motion is trying to take him to court but does not know where he is. O'Donnell has been repeatedly rapped for professional misconduct and negligence. The Law Society won an interim interdict at the Court of Session Edinburgh three years ago, banning him from posing as a solicitor. Six Months ago, we revealed that O'Donnell was allegedly using another lawyer's identity to beat the ban. 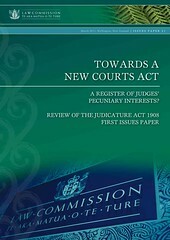 That prompted the Law Society to take action against him for flouting the interdict. One source said : "The problem is that he's nowhere to be seen and does not appear keen to make himself available." The Law Society said : "John O'Donnell does not hold a current practising certificate and therefore cannot practise as a solicitor in Scotland. "The Law Society applied to the court to serve notice - by way of an advertisement in the press - of an alleged breach of an interim interdict." "The Interim Interdict included an order preventing Mr O'Donnell from holding himself out as entitled by law to practise as a solicitor." "The application to service a notice was granted by the court on October 16"
Already wounded over refusals to investigate complaints against corrupt lawyers, the SLCC became “a laughing stock" in email revelations. A DRINK FUELLED hate-filled rant between a now former Board member of the Scottish Legal Complaints Commission (SLCC) who was personally appointed by Justice Secretary Kenny MacAskill, and a former Chief Executive who mysteriously resigned over ill health then turned up again at the Scottish Public Services Ombudsman has been identified by Scottish Government insiders as the spark which left the SLCC with no credibility as an impartial regulator or of Scottish solicitors. 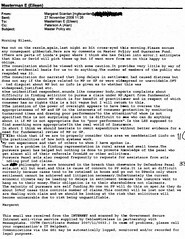 In the bitter email exchanges, revealed after Freedom of Information requests were made by Diary of Injustice, Mrs Scanlan went on to single out a former complaints campaign group for special attention, demanding the SLCC give no recognition to such groups in a forthcoming investigation into the Law Society of Scotland’s Master Insurance Policy & Guarantee Fund, both of which have been roundly condemned as being “institutionally corrupt” by Consumer rights groups, submissions made to Scottish Parliament investigations and hundreds of clients who have ended up financially ruined as a result of involvement with the Scottish legal profession. 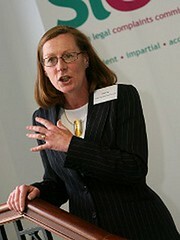 Mrs Scanlan also branded claimants to the notoriously corrupt Master Insurance Policy as “chancers”, yet a ground breaking investigation carried out by the University of Manchester’s law school later that same year in July 2009, linked the Law Society’s Master Policy with suicides of clients of solicitors who were involved in damages claims against the Master Policy compensation scheme after being financially ruined by their lawyers. Margaret Scanlan was ‘on the razzle again’ while clients of ‘crooked lawyers’ burned. 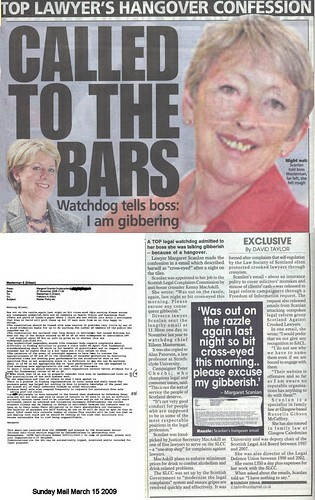 Yesterday, the Sunday Mail newspaper featured email correspondence obtained under Freedom of Information laws in which SLCC board member Margaret Scanlan, a solicitor with Russells Gibson McCaffrey in Glasgow, confessed to the Commission she was suffering from the effects of a hangover after being “'out on the razzle again last night”. 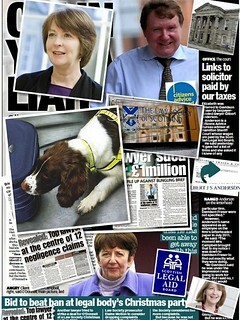 Stunningly Scanlan in her emails then went on to tear apart consumers hopes the SLCC would fulfil its intended monitoring role of the ‘crooked lawyer compensation schemes, operated by the Law Society of Scotland, known as the Guarantee Fund & Master Insurance Policy which are designed to (but do not) protect consumers funds from crooked lawyers who steal money or mishandling client’s legal affairs. Margaret Scanlan condemns claimants against crooked lawyers as “chancers”. 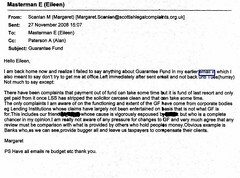 However, further emails from Margaret Scanlan have now emerged which depict the same Law Society style 'anti-consumer-anti-claims culture' operating at the supposedly independent Legal Complaints Commission, where Scanlan stunningly labels claimants to the Guarantee Fund as "chancers" indicating she may have personal knowledge of cases, despite the fact that claims to the Guarantee Fund are supposedly confidential. Margaret Scanlan : "The only complaints I am aware of on the functioning and extent of the GF [Guarantee Fund] have come from corporate bodies eg lending Institutions whose claims have largely not been entertained on basis that is not what GF is for. This includes our friend **** (censored) whose cause is vigorously espoused by **** (censored) but is a complete chancer in my opinion." Today, a senior source in the Scottish Government’s Justice Department claimed the revelations which ended up in the media, “revealed the regulator’s institutional contempt for members of the public who make complaints against crooked lawyers”. The source also went on to criticise the Justice Secretary himself for allowing the legal profession to dictate terms on a daily basis as to how the supposedly “independent” SLCC investigate complaints made by clients of poorly performing Scottish solicitors. However, the anti-client culture at the Scottish Legal Complaints Commission did not end with just one board member, a fact revealed in continuing investigations by Diary of Injustice after sources within the SLCC leaked details of bitter meetings where consumers, campaign groups, individuals and clients of well known corrupt lawyers were openly slated and derided by the highly remunerated Board members who were taking hundreds of pounds a day in expenses claims. SLCC’s David Smith expressed anti-client jibes in emails around the anti-consumer law complaints quango. 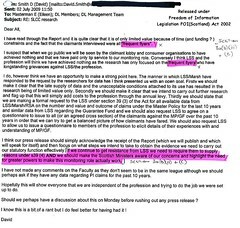 Among the papers ordered to be disclosed in a decision published late last week by Mr Dunion are emails containing anti-client jibes from one of the SLCC’s board members, David Smith who was personally appointed to the SLCC by Justice Secretary Kenny MacAskill. Mr Smith, a lawyer who served much of his career at law firm Shepherd & Wedderburn, who themselves often act for the Master Policy in protection of questionable solicitors against negligence claims, referred to participants in the Master Policy survey & deceased clients who had committed suicide as a direct result of involvement with the Master Policy, as “Frequent flyers”, a term (among many unprintable) apparently widely used among SLCC Board members & staff against anyone who submits complaints against solicitors. David Smith, Margaret Scanlan and Eileen Masterman are of course no longer at the SLCC, yet attempts to re-float the Scottish Legal Complaints Commission since the media revelations of how badly it views members of the public have consistently failed, with most people forced to deal with the prejudiced regulator ending up viewing the SLCC as little more than “a front company for the legal profession to put complaints against their members to bed”. A TOP legal watchdog admitted to her boss she was talking gibberish - because of a hangover. Lawyer Margaret Scanlan made the confession in a email which described herself as "cross-eyed" after a night on the tiles. Scanlan was appointed to her job in the Scottish Legal Complaints Commission by anti-booze crusader Kenny MacAskill. She wrote: "Was out on the razzle, again, last night so bit cross-eyed this morning. Please excuse any consequent gibberish." Divorce lawyer Scanlan sent the lengthy email at 11.30am one day in November last year to watchdog chief Eileen Masterman. It was also copied to Alan Paterson, a law professor at Strathclyde University. Campaigner Peter Cherbi, who champions legal and consumer issues, said: "This is not the sort of service the people of Scotland deserve. "It's not very good conduct for people who are supposed to be in some of the most respectable positions in the legal profession." Scanlan was hand picked by Justice Secretary MacAskill as one of five lawyers to serve on the SLCC - a "one-stop shop" for complaints against lawyers. MacAskill plans to enforce mimimum prices for drink to combat alcoholism and drink-related problems. 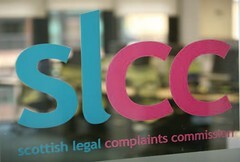 The SLCC was set up by the Scottish Government to "modernise the legal complaints" system and ensure gripes are resolved quickly and effectively. 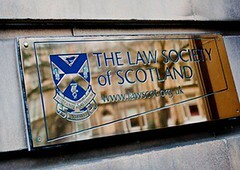 It was formed after complaints that self-regulation by the Law Society of Scotland often protected crooked lawyers through cronyism. Scanlan's email - about an insurance policy to cover solicitors' mistakes and misuse of clients' cash - was released to legal reform campaigners through a Freedom of Information request. 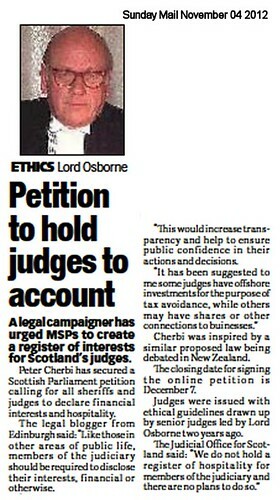 The request also released emails from Scanlan attacking outspoken legal reform group Scotland Against Crooked Lawyers. In one email, she wrote: "I would prefer that we not give any recognition to SACL. "I do not see why we have to name them even if we are bound to engage with them. "Their website is offensive and so far as I am aware no reputable organisations has anything to do with them"
Scanlan is a specialist in family law at Glasgow-based Russells Gibson McCaffrey. She has also tutored in family law at Glasgow Caledonian University and was deputy chair of the Scottish Legal Aid Board between 1997 and 2007. She was also director of the Legal Defence Union between 1998 and 2002. She earns £350 a day plus expenses for her work with the SLCC. When asked about the emails, Scanlan told us: "I have nothing to say." 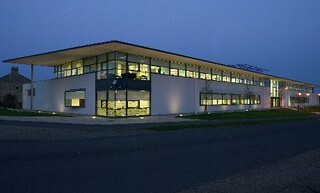 Plush offices of Kilwinning based Accountant in Bankruptcy, who target disabled benefits cash. AT THE END of a week when the Scottish Government announced there have been 4,063 personal insolvencies in the past year, it may well come as a surprise to learn that papers now in the hands of MSPs and an MP, reveal that Scotland's Accountant in Bankruptcy (AIB) is conveniently looking the other way while its highly paid, ‘bully boy’ agents routinely seize Scots benefits cash in attempts to force unnecessary payments out of even the long term sick and disabled victims of the current recession. It can also be revealed the same ‘bully-boy’ firms of private accountants who go on to seize the bank accounts of sequestrated individuals, are being paid millions of pounds of public money by the AIB to do it, and when victims are forced to complain about their benefits being withheld, contrary to laws put in place to prevent this, the Accountant in Bankruptcy and their agents refuse to allow external investigations by banking & finance regulators. Journalists from Diary of Injustice who have been looking into this huge bankruptcy scam on the public purse, recently made Freedom of Information requests to the Accountant in Bankruptcy, asking for details of expenditures of public money on private accountants acting as the AIB’s “agents” and the numbers of complaints made against each of the AIB’s agents. In it’s response. the Accountant in Bankruptcy revealed that at least EIGHT MILLION POUNDS of taxpayers cash (£8,021,756.62) has already been spent on private accountants working for the already overstaffed multi million pound budgeted public body in charge of sequestrations. The AIB have also revealed a litany of complaints made against its agents but it refused to release any details of the actual complaints and confirm whether matters were in fact resolved. I can confirm that Armstrong Watson is one of those Providers. Since the commencement of this contract in April 2009, until 31 March 2012, Armstrong Watson has been paid £1,051,627.12 for the administration of cases on behalf of The Accountant in Bankruptcy. To date they have been allocated 2062 cases. I can confirm that there have been 11 complaints made to AiB in respect of Armstrong Watson, from 1 April 2009 to date, 2 August 2012. I can confirm that Hastings & Co are one of those Providers. Since the commencement of this contract in April 2009, until 31 March 2012, Hastings & Co have been paid £608,605.96 for the administration of cases on behalf of The Accountant in Bankruptcy. To date they have been allocated 1040 cases. I can confirm that there have been 8 complaints made to AiB in respect of Hastings & Co, from 1 April 2009 to date, 2 August 2012. I can confirm that Invocas is one of those Providers. Since the commencement of this contract in April 2009, until 31 March 2012, Invocas has been paid £284,346.77 for the administration of cases on behalf of The Accountant in Bankruptcy. To date they have been allocated 875 cases. I can confirm that there have been 6 complaints made to AiB in respect of Invocas, from 1 April 2009 to date, 2 August 2012. I can confirm that KPMG is one of those Providers. Since the commencement of this contract in April 2009, until 31 March 2012, KPMG has been paid £3,706,744.79 for the administration of cases on behalf of The Accountant in Bankruptcy. To date they have been allocated 6585 cases. 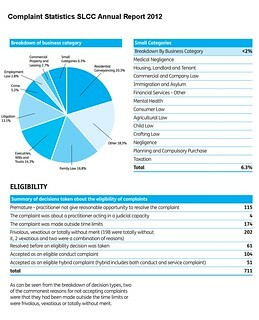 I can confirm that there have been 28 complaints made to AiB in respect of KPMG, from 1 April 2009 to date, 2 August 2012. I can confirm that Miller McIntyre & Gellatly (now mmg archbold) is one of those Providers. Since the commencement of this contract in April 2009, until 31 March 2012, MMG have been paid £303,745.48 for the administration of cases on behalf of The Accountant in Bankruptcy. To date they have been allocated 710 cases. I can confirm that there has been 1 complaint made to AiB in respect of MMG, from 1 April 2009 to date, 2 August 2012. Since the commencement of this contract in April 2009, until 31 March 2012, Wylie & Bisset have been paid £2,066,686.50, for the administration of cases on behalf of The Accountant in Bankruptcy. To date they have been allocated 3703 cases. I can confirm that there have been 18 complaints made to AiB in respect of Wylie & Bisset, from 1 April 2009 to date, 27 July 2012. After looking into cases brought to the attention of Diary of Injustice, it has now been confirmed several of the firms identified in the above FOI response have been subject to serious complaints relating to how sequestrations have been handled, including matters involving the freezing of bank accounts and access to state funds. Papers relating to one such case now in the hands of Perth MSP John Park confirm that agents acting on behalf of the Accountant in Bankruptcy have blocked access to disability benefits payments made to individuals who have suffered sequestration under highly questionable circumstances, for up to SEVEN MONTHS at a time. An investigation of Mr Gordon’s case on Scots law website Scottish Law Reporter identified a firm Glasgow accountants, Wylie & Bisset who have been acting for the Accountant in Bankruptcy against Mr Gordon. The Herald newspaper & Scottish Law Reporter have previously reported that Wylie & Bisset, who have been paid a whopping TWO MILLION POUNDS of public money to act for the AIB in sequestration cases, had also attempted to seize Mr Gordon's home (which he does not own) and the home of an unrelated family in another town in order to pay off questionable debts claimed by a Perth based law firm, Kippen Campbell. Diary of Injustice has previously reported on Mr Gordon’s case, after Kippen Campbell decided to bankrupt Mr Gordon, their former client, over a fees dispute, even though documents produced to the Scottish Legal Complaints Commission revealed Kippen Campbell had left their client on the doorstep of the Court of Session without legal representation after a long battle to bring a personal injury claim. It has shockingly turned out that since the last report on Mr Gordon’s case, where his accounts were unfrozen, the agents acting for the AIB along with Lloyds TSB, Mr Gordon's bank, froze his accounts again, and have since refused to offer any explanation for their conduct. Earlier this week, Diary of Injustice was handed copies of papers now in the hands of John Park MSP, and the SNP’s Pete Wishart MP at Westminster, which show the AIB’s agents, Wylie & Bisset have even refused requests from the Financial Ombudsman to investigate complaints made about the case by Mr Gordon, a move which suggests private firms acting on behalf of the Accountant in Bankruptcy are effectively unregulated, and can do as they please to victims of the credit crunch, brought about by the antics of corrupt, greedy bankers & their colleagues. Speaking to Diary of Injustice yesterday (Friday), an official with one of Scotland’s Consumer protection bodies condemned the treatment of Mr Gordon and others at the hands of the AIB. She added that the matter was so serious it must be raised in discussions with a view to making amendments to the coming Bankruptcy Bill, proposed by the SNP to be brought before the Scottish Parliament at a later date. After Mr Gordon’s plight became public, Diary of Injustice received numerous emails from individuals caught in similar circumstances where agents acting for the AIB have also blocked access to state benefits payments, in what appears to be a popular policy of holding the poorest in society to ransom, in an effort to extort unnecessary payments back to the AIB’s agents who are already raking in millions of pounds of taxpayers money. No one from the Accountant in Bankruptcy has answered or explained why it has not acted over complaints about bully boy tactics by its own agents in cases where bank accounts and state benefits payments to victims of disabilities have been frozen for such long periods of time. If you have encountered difficulties with the Accountant in Bankruptcy or their agents, please let us know via scottishlawreporters@gmail.com. Anyone in such a situation should also ask for help from their MSP, in the light of the planned new legislation on bankruptcies in the Scottish Parliament.